Organizational culture is not a new term for many of us !! Gone are the days, when employees used to be satisfied with job security, even when Organizational culture wasn’t particularly good. Organizational culture is not perks and compensation. It is more than that!! Organizational culture is the environment that surrounds us at our workplace. It is a powerful element which we cannot see. An Organization culture is made up of values, beliefs, attitudes, and behaviors of the team – members. These attributes are unspoken and unwritten. Organizational culture is important to ensure that employees are happy and work productivity is good. It has great influences on behavior and thought within Organizations. It encompasses many aspects of a business. Culture is about feelings, behaviors and meaningful relationships, not things. It involves trust and respect which comes from the top down. Collaboration is at the heart of good business culture. How is Organizational culture formed?!?! A bad culture usually develops gradually with harmful effects. It is toxic in nature and needs immediate correction. It is seen in an Organization where there are differences in the relationship between Management and Staff. Other characteristics of a bad Organization culture is micromanagement, disrespectful or weak leadership, bullying behavior, a lack of trust, no flexibility, discrimination and zero praise all contribute to harmful company culture. At the other end of the spectrum, a good company culture encourages personal growth, offers flexibility, fosters trust, encourages risk-taking and encourages praise and acknowledgment. A prospective candidate experiences a sense of our Organizational culture on the very first phone interaction from the HR personnel. The applicant further forms an opinion of Organizational culture during the interview process. The applicant evaluates his/her thought on whether he/she is a good fit in this Organizational culture. We provide freedom, flexibility, trust and encourage employees to get innovative and creative. 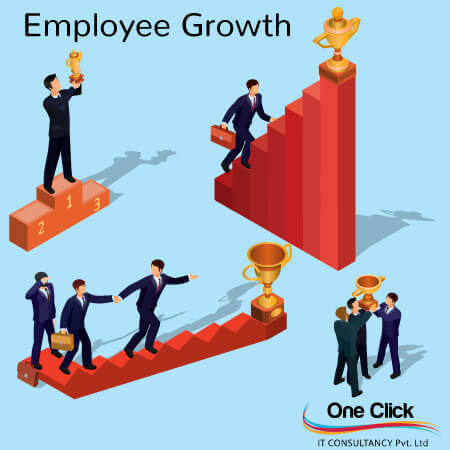 We have a friendly work environment which encourages the team members to work smart and hard for achieving their dreams and directly/indirectly facilitates to grow the organization. We support flexible working hours, encourage regular team meetings, company-wide meetings, and team lunches. We encourage open discussion and value everyone feedback. We have team building activities for sharing ideas and implementing them.